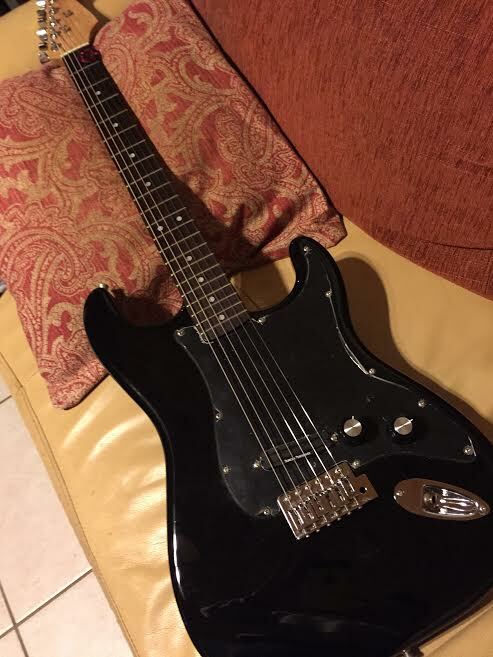 My wife picked up a starcaster at a garage sale for cheap because it had fender on the headstock. I did a set up and slapped on some new strings. 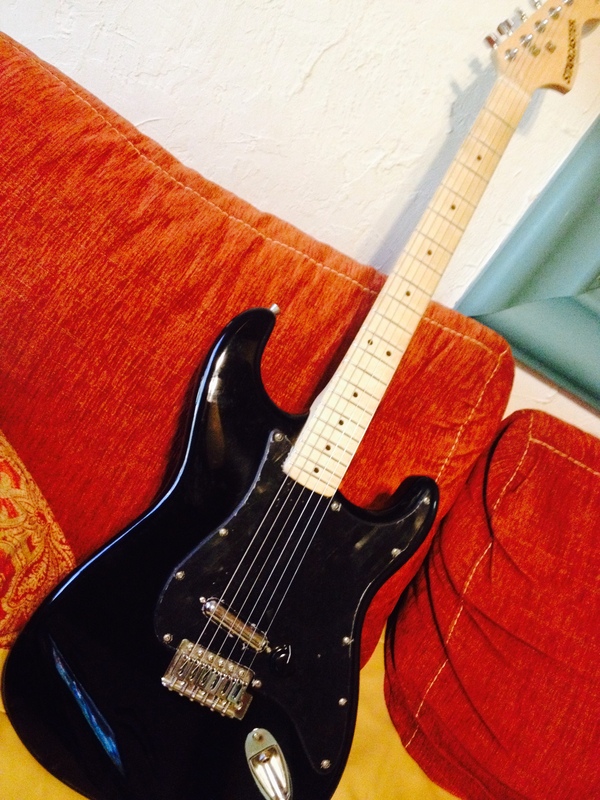 I liked it, it has a nice chunky neck and is easy to play. Very light body. Not bad for a beginners guitar. It came with white guard and pup covers. I actually sounded really nice how it was. So I figured it would be a fun project. I am not sure if it had original pups and guard, because it was three ply w/b/w and the ceramic pups sounded nice but had odd cut wires to the volume pot still attached. 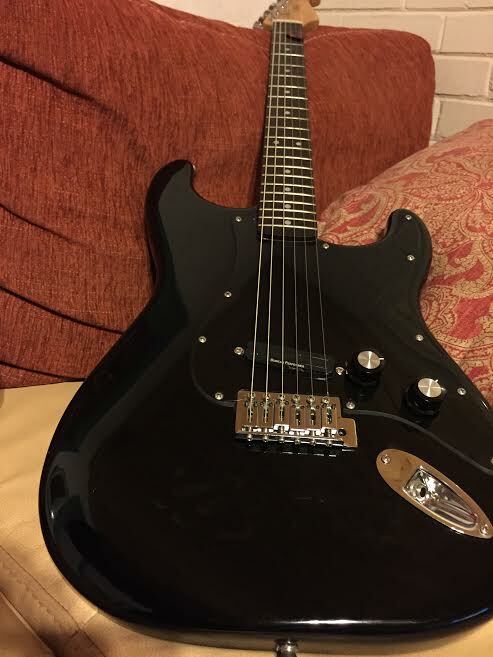 Basically, cut a new all black glossy pickguard (protective plastic still on in pics) with only one bridge pickup cutout and one hole for the vol/tone pot. I took my high output GFS bridge lipstick that I had in the little stagg guitar that the roe's have now and slapped it in with 250 push pull pot. In is volume and out is tone. I also have a bent saddle, big block steel tremolo from GFS that I will toss on. changed my mind. and changed out the pickup. went with a duncan performer - scorcher for strats that I had laying around. I got a big box of parts and bits from my brother for christmas last year and I had a couple of these in it. 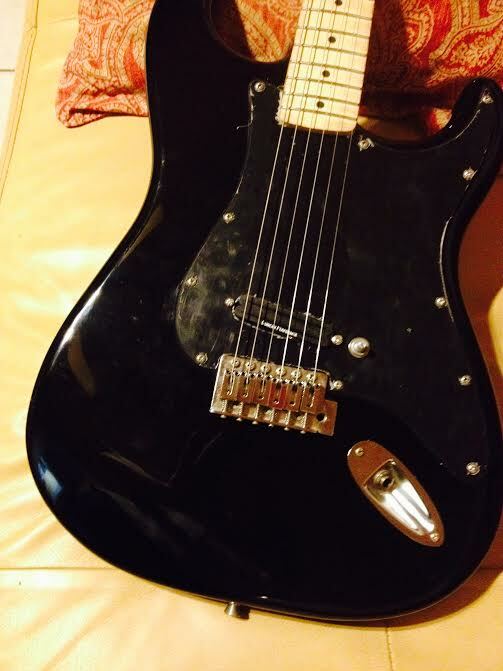 I wired the push pull for Bucker, in and single coil out and then put in a tone pot. have not drilled for the tone pot yet. 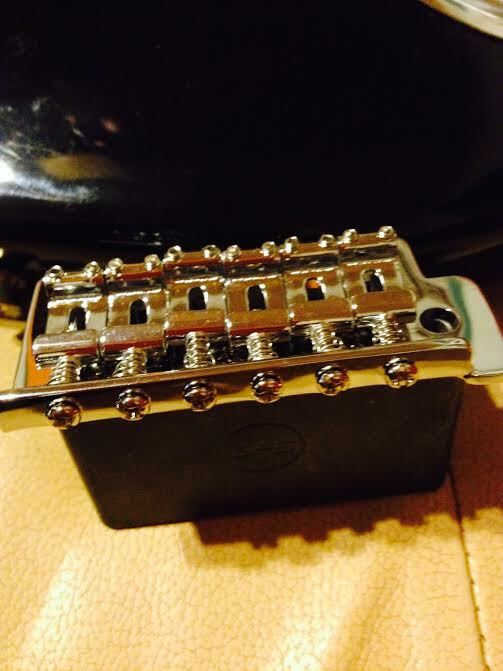 once I get it tweaked on the setup, I will put in the GFS steel bridge tremolo. Nice. I love working on cheap guitars, no pressure. 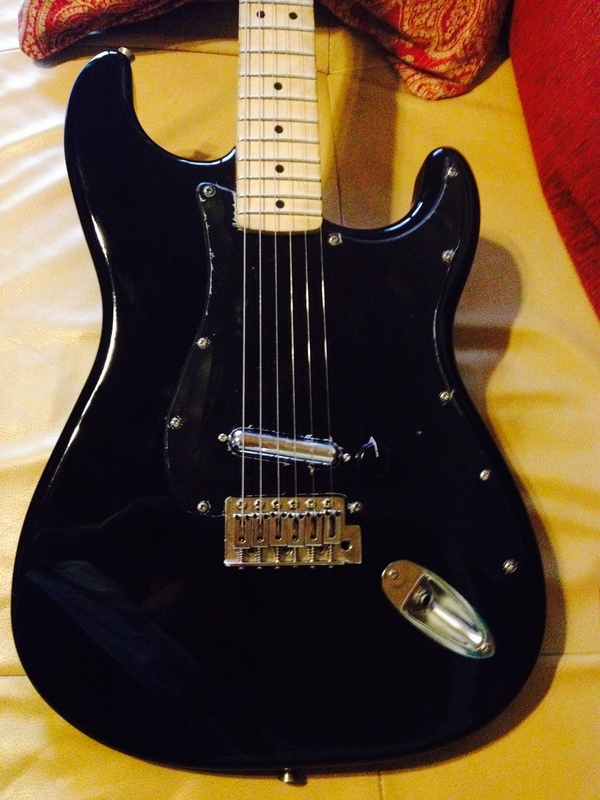 White on black Strats are the most boring guitars ever but black on black are most definitely not. so when I got it set up there was one wonky fret on the maple neck. I am thinking of doing my first re fret on this neck for shits and giggles. so I went to GFS and got a nice neck from their factory clearance section. 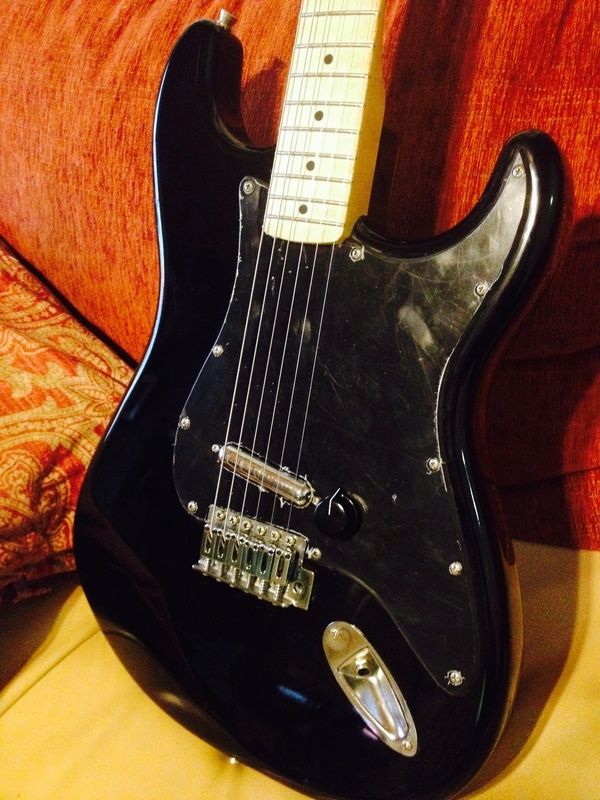 it is a small headstock squier. I did a fret polish, sanded nice and then did a danish oil finish on it. nice D shaped neck with a flatter radius. not sure what squier model it would have been on, but there is no problems with it and it has nice maple and good frets. 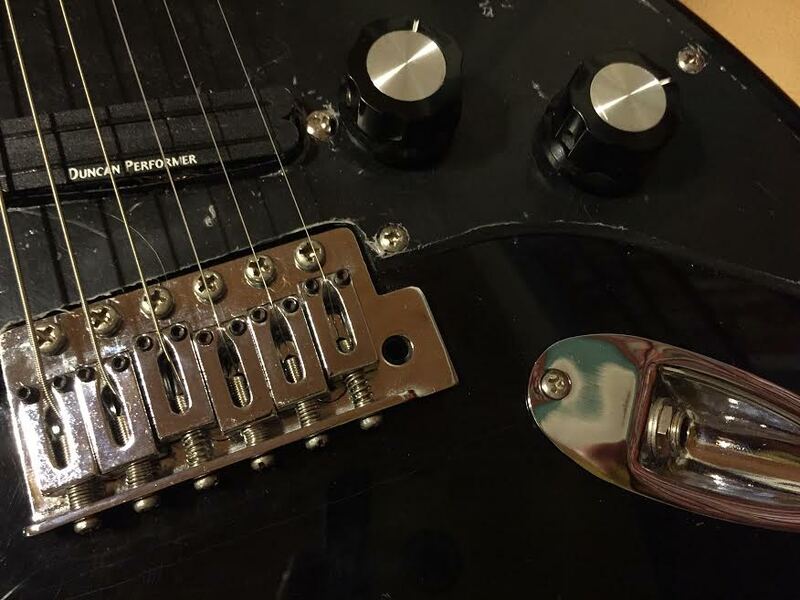 Other GFS parts that I put on it are big steel block (super upgrade to do on any cheap strat - this thing just rings out now), a nice chrome polished jack plate. I wired the duncan performer scorcher (24K) to a push pull pot for bucker and pull single coil. This thing is a blast. still have not removed the plastic wrap from the new pickguard yet. Reminds me of the white and black EVH Strat. Nice. took of the plastic from the pickguard. now all I need to do is adjust the string height at the nut.